I ADORE this song's message and sound. You've GOT to read the words as well as listen! What a fabulous love song about keeping even our hearts pure while we wait for that special soul God is preparing for us to share our lives with! I have loved the music of this group since the first time my youngest daughter shared some of it with me. We were blessed to get to take my girls to Nashville several times to hear them live at the Spike and Crown coffee house. I still can't understand why they didn't become huge. Their music, messages and harmony are so unique and oh so powerful. I haven't given up hope they will get back together and make some more music to bless us and glorify God. 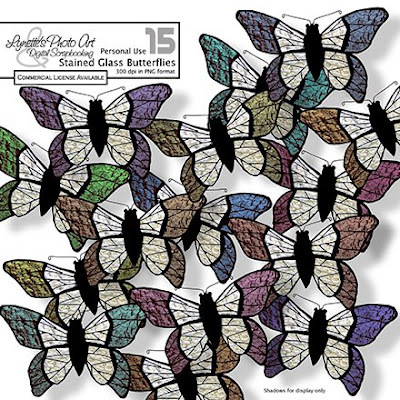 There are 17 downloads to this lovely and delicate collection. You can find any you have missed in the archives in the left column. 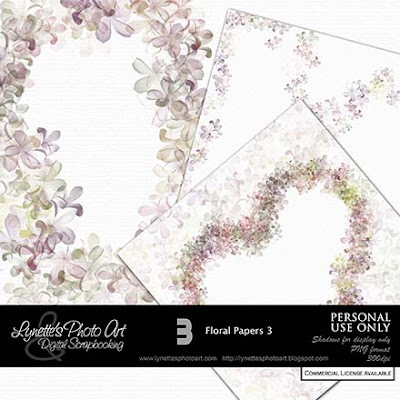 There are 25 papers with a subtle background and texture under the flowers and lots of overlays. I hope you will take a moment and just soak in the truth of these mellow but vital words. "Christ also loved the church and gave Himself up for her, so that He might sanctify her, having cleansed her by the washing of water with the word" Ephesians 5:25,26 The Bible is the Word of God. Several of you have asked for help with the brush set I gave you recently, so here's a very brief little tut. Unzip the file you downloaded. 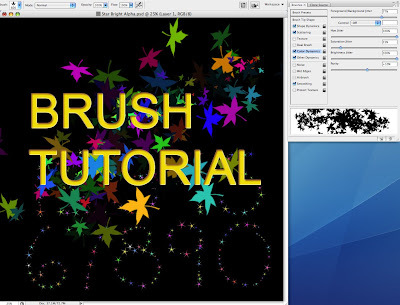 If you want the brushes to show at the bottom of the flyout menu on your brush palette, drag the brush icon below, that is in your download file, into the PhotoShop presets folder where ever you have it stored in your hard drive. 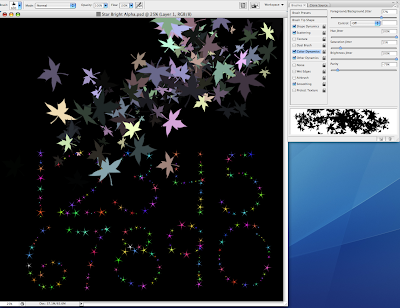 The next time you open PS, this brush set will be there at the bottom of the list. If you don't care about that, all you need do is double click the brush icon in the folder you downloaded, no matter where you have it, and it will load in PS. TIP: I always keep a separate folder called "PhotoShop Presets" on my hard drive with folders for all my goodies in them (brushes, custom shapes, patterns, etc. ), so that if I have to reinstall PS, I won't loose them. It's a good back up and has blessed me often. 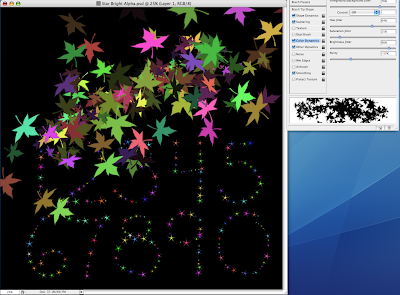 Another benefit of not loading many goodies into the PS preset folder is it slows things down the more that's there. 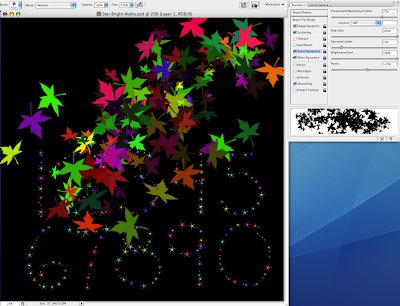 You open the brush palette (shown at the right of the image below) by clicking this icon. Since you've double clicked the brush icon from the download, the brush will show up at the bottom of the brush palette when you open it. In the brush palette, there are options down the left side. Click on "color dynamics". This is one of PS's coolest gifts! Set your front and back color swatches to colors you like, then start playing with the slide bars on the right of the brush palette and experiment until you get something you like. 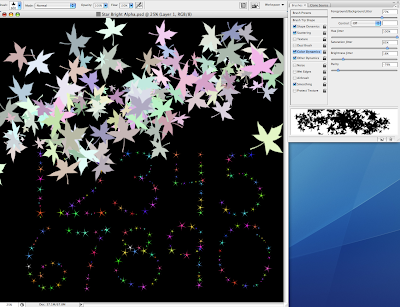 The color swatches are at the bottom of your tool box in the far left of this image. I have them set to yellow and orange for this demo. You can see that with the settings I'm showing you, that yellow and orange become much more. As with all things PhotoShop, the real fun starts when you begin exploring and experimenting! Have fun! I have another powerful video for you today. Someone worked REALLY hard illustrating this one. Hope it blesses you. "Daddy, can you come to my game?" "Oh Baby, please don't work late." He used to say, "Whoever dies with the most toys wins"
First, several of you have asked for directions on how to install the brushes I gave you the other day and how to make them multiple colors. Come back tomorrow and I'll have a tutorial for you all about it - and of course, another gift! Today I'm going to start giving you a huge collection of beautiful things suitable for a wedding book or whatever. 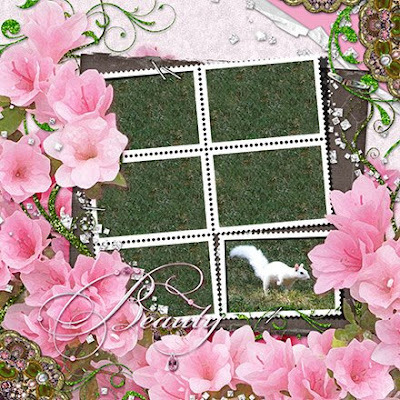 There are 17 downloads to this lovely and delicate collection. You can find any you have missed in the archives in the left column. 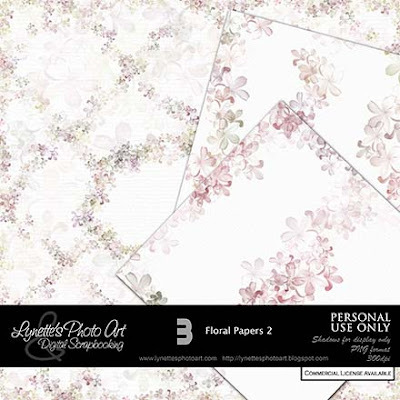 There are 25 papers with a subtle background and texture under the flowers and lots of overlays. Enjoy! I am dedicating today's freebie to Emmie and Nick who were looking forward to holding their precious first child, who is now nestled safe in the loving arms of Jesus. Our prayers are with you and all who are impacted by this. Your attitudes are a glory to God. We send you our love and support. May God comfort you as only He can. 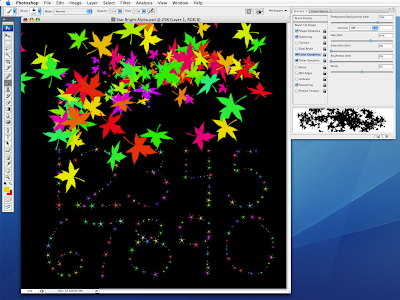 NOTE: You have requested an alpha to match yesterday's numbers...I'm so glad you like them! In answer, I gave you the brush so you are able to make anything you want to match, even an alpha, so at the moment I don't plan to make an alpha, but I'm not saying I absolutely won't. I don't have a graphics tablet and my mouse is awful, so I don't think I'd do a very good job with the alpha. The brush has several variations included if I remember correctly, so have fun and experiment! Many people have been "inoculated" against Christianity and are now all but immune to the message of salvation. They have witnessed the life of someone who calls themself a Christian and they have not seen Christ in their lives. They have been harmed by those who wear the name Christian, but do not live the life, and now it will be very difficult indeed to reach them with the life giving Word of God. I propose for your consideration that just calling oneself a Christian does not make it so. Jesus Himself said that on the day of judgment, which every person who ever lived will someday face, there will be those who call Him "Lord", and will not enter heaven. A true Christian is one who "does the will of My Father who is in heaven". By Jesus' own words it will be only those who enter into heaven. He's not saying that we must be perfect to get into heaven. Scripture is clear that "all sin and fall short of the glory of God". Romans 3:23 Even once we are saved we still slip and sin and we may hurt others in our sin. The difference is that as soon as the Holy Spirit convicts us of that sin, we repent with our whole heart, begging God's forgiveness and sincerely determine to live by His Word the rest of our lives. 1 John 1:9 He forgives us because we are walking in the light with Him, trying our best to live lives in conformity with His will and law. His grace covers us because of this, and so, we meet the criteria of "doing the will of the Father". If our sin harmed another, it's up to us to go to them and repent to them, letting them know that we were wrong and have asked God's forgiveness. If appropriate, we ask their forgiveness also. Let us not bring shame on the Body of Christ which Jesus gave His life for. If you are one of those who has turned off the saving message of love from God because of what you have seen in the lives of others claiming to be Christians, please take into account that we are only true "Christians" if we are living in obedience to the Bible. Harm done to you by others cannot be held to the account of Christianity, but the devil would love you to keep doing this as it's effectively sending you to hell right now. Your Heavenly Father pleads with you to come to Him for salvation because He longs to be with you and heal all your wounds. NOTE: A couple of you had difficulty with yesterday's download. There's a new link so go try it again. Works fine for me. Let me know if you have difficulty. 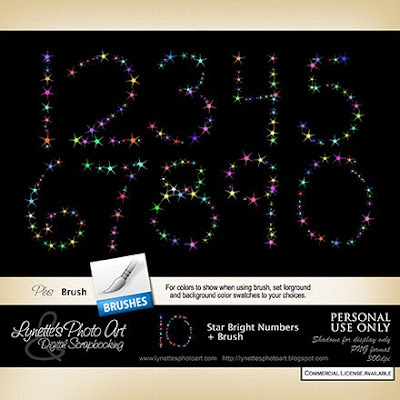 Today's freebie is a happy little set of Star Bright Numbers. They don't show very well in this little preview, but they are really cute and I hope you will give them a try. If you need basic info on installing a brush click here. For more info on using brushes just Google it. There's a wealth of tuts out there for free. Jesus loves me this I know. For the Bible tells me so. They are weak but He is strong. The Bible tells me so. Still He bids me trust in Him. He'll be there to lead the way . In my heart He puts a song. "Have no fear, for I am near." And life's victories have been won. Then I'll understand His love. I love Jesus, does He know? Have I ever told Him so? That I love Him every day. This is another gift that's very special to me as this is cross stitch I did for the front of one of my Baby Books for my oldest daughter when she was growing up. Yes I said "Baby Books" plural. When the store bought one filled up I just kept going. There are many volumes of them for my children now and each is covered with a specially sewn cover portraying that age. Some are appliqued, cross stitched, quilted, stenciled, quite an assortment. 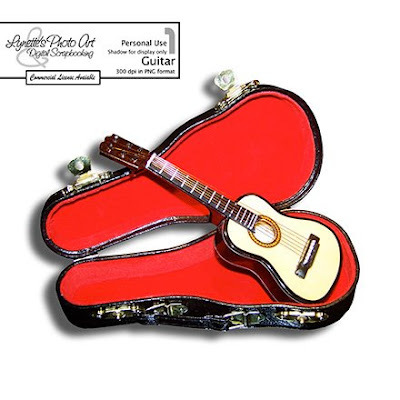 This is a 4" tall box that closes completely and prints on an 8.5x11"sheet. I made the instructions very detailed along with diagrams to make sure everyone can make them successfully. Enjoy! I am so sorry that some of you have had a problem with this download. It works fine for me, but I have re-uploaded it and this is a NEW LINK! Again, so sorry and I've been gone all day to a block party for church in another state. Didn't get your post till almost 10:30 PM and we've just gotten home. This gift is an overlay that turns your photos into art. 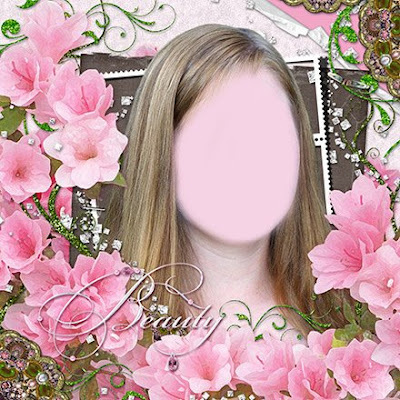 Try the different blending modes to vary the appearance. 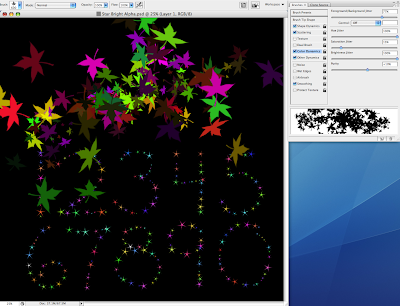 Multiply, Screen, Overlay and Soft Light are my main favorites with this image. 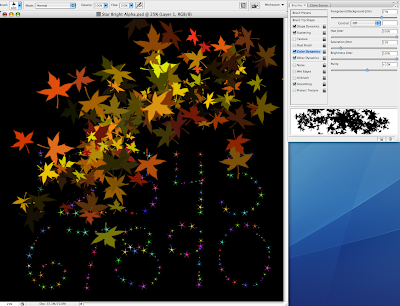 Do you see how an overlay changes a sharp image into "artwork"? 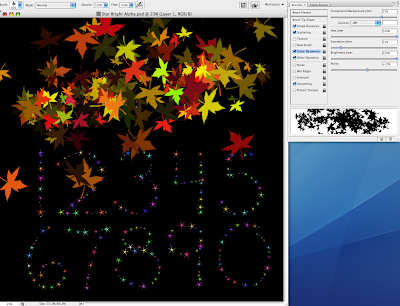 It creates less precise brush strokes. It blurs the sharp edges. It makes it harder to determine just where the line between black and white is. Satan does the same thing in our lives. He tempts us with many things and whispers lies to us that this or that are not really wrong. He's trying to create blurry lines, grey areas in our consciences. If we listen, even the most sincere person can find themselves on the wrong side of the line when they can no longer really see where the line is. He's pretty well convinced society today that "truth" is a fluctuating thing, that it's mostly grey area. This pretty well throws the line out completely and many won't know what side they are standing on until the judgment day. Then it will be too late. Truth never changes. It is immovable and cannot be altered, not by the of passing time or changes in public opinion, not by anything. You are your child's parent. This is truth. It doesn't matter how many thousands of years pass, what the latest public opinion pole says, what the latest psychobabble guru says - nothing can alter the truth that you are the parent of your child. It is truth. The Word of God is truth and not the smallest letter or stroke has passed away. We see that everywhere. In the name of being "modern" or "progressive", even in the name of "reaching the lost", churches are watering down the truth of the Gospel. Many churches no longer preach the cross of Christ or His blood sacrifice which cleanses us from sin and paid the price to redeem us from hell. They tell us that could offend someone. Yup! They're right! It offends satan - the enemy of our souls! The won't call sin "sin" because it could offend someone. Yes, the Holy Spirit of God uses the reading of the truth of the Holy Scriptures to convict souls unto salvation. If you do not preach sin, or the cross and blood of Jesus Christ, you have just effectively removed the means Father God has provided for us to be saved eternally! Tell me, what possible good will anyone receive from attending church services without the power of God unto salvation? Perhaps just warming a pew will get one to heaven? Not according to the unchanging Word of God it won't! Hold fast to the truth which once was delivered to you! at the bottom of this post as I have disabled 4shared comments. This helps me to know what you like for the future. God bless you! Link expired. Available now in my PayPal store. E-mail me if you don't find it. Today I'm going to share something I've just sent in answer to an e-mail. I think there are a lot of people in this situation. So many of us are hurt and overwhelmed. I hope this blesses someone. I am honored that you have shared so deeply with me and my heart aches reading your letter. I pray you can hear what I am going to say. Firstly, there is hope. This is not forever. Take courage. Next, I want to remind you that as those who wear the name of Christ, we have an enemy. The more we love God and want to serve Him, the more of a threat we are to the enemy and the harder he works to discourage us and get us believing his lies so that we become no threat to him at all, just another victim. Your letter shows that you are believing several of his lies and have become paralyzed by that belief to the point that you no longer gather with the brethren for worship or even feel you can come to a church activity that you are “excited” about. He has told you that the "church" is a place only for those who are "perfect", have lots of money to support the work, are prospering spiritually right now, etc. That's a lie. Jesus gave us the church to be His body on earth. The church is to be a place where we are healed and loved, nestled in a fellowship of like believers on the same journey, so we understand. Everyone is either in the storm now, is just coming out of one or is on their way into one. If you could see the lives of others in church, you’d see the “Sunday faces” are not the full truth. Church is a place where our faith grows from receiving teaching, knowing other Christians and seeing His hand at work in their lives. A place to receive encouragement and help when things are bad. The church is the family of God - YOUR family. Family sticks together. It's the place we run to when life gets hard, not the place we withdraw from. It’s the place we are loved, warts and all. It is through being part of a fellowship of Christian believers that we build relationships with others who will lift us before the throne of God in prayer tirelessly in our time of need. He has told you that you can't "help the church" in any way but financially. Just your being there helps! You are unique as is every member of the family He has blessed you with. Just being present encourages others. Just your commitment to faithfully gather with the brethren and worship God in this corporate setting encourages others. What if only those who "didn't need God" showed up for church? What when the lost person who is down and out visited? They would see only people with “everything together” and they would feel out of place, unwelcome and as if they had nothing in common with these people. Sadly they wouldn’t know we have ALL been where they are now and what they are seeing is the work of God in our lives. The message would be that same lie of the devil that church is for those who are “perfect”, not for the lost sinner and he’d leave unsaved, maybe never to be saved. As Christians we gave our lives to Christ. Our lives are His now, not ours. We need to cleave ever more closely to Him during times of hardship, weakness and trial. We will surely be overwhelmed on our own, but in Him we are more than conquers. The very fact that we keep pressing on even during these dark times, is witness to the fact that we truly gave Him our lives that day when we were saved. When a lost visitor comes in and sees genuine people seeking God unashamedly with all their hearts to meet the dire need in their lives, they are encouraged that the Gospel of Salvation is alive and effective. A genuine Christian can weep unashamedly at the altar seeking their God and pouring their heart out to Him. (That’s why there are Kleenex there!) We are at worship for the Almighty God, not to please those who are standing around us. Our faith means little until it’s tested. It’s during these times of darkness that it’s the most important that we hold fast to Him who is our only hope and help. When we withdraw on our own, it is much easier for the enemy to pick us off – one lone sheep away from the flock and the shepherds (leadership watching over our souls). You mentioned not being able to “muster the strength to be a light for someone to find their way”. This is another lie of the enemy you have believed. It’s not up to us to “muster” this. Light in our lives is the byproduct of our walk with God, through the good times and especially the bad. Any light we ourselves “muster” is counterfeit and worthless. The lost will see right through it as does our dear Savior. It is often during the dark times in life when we are overwhelmed that our light shines the brightest, whether we know it or not. It all depends on the choice you make – to draw ever nearer to God and cleave to Him or to withdraw. Possibly the brightest light I have been privileged to witness was in a dying 21 year old friend of my daughter and her mother. Indeed they had every right to be overwhelmed those long horrible months. But they both chose to cleave to our Lord and they glorified Him by this choice. Everyone who was in contact with this situation still today talks of how astoundingly they glorified Him in how they walked this dark path. Their terrible situation touched countless lives for Christ and it was their very darkest hour, nor were they aware that their lights were so brilliant. His lies told you that church is all about what you can do for the church. This lie you have believed has successfully taken your eyes off God and put them on yourself. Being part of a fellowship is not only about what you can do for the church. It is to your great credit that you do have this concern, but our reason for being part of the church is HIM. We come to worship Him in a corporate setting because He is worthy. He is no less worthy when we are in the storm. We need bring nothing but ourselves, stripped of all pretension. We need bring nothing but our hearts to Him fully in worship, pouring out everything, hurt and joy alike. When the enemy can get us to take our eyes off Him and put them on ourselves, we loose our way. He has told you that because so many others are praying to God, your prayers are unheard. What He’s really saying is that God is not big enough, not powerful enough to meet your needs. He’s saying that God is a liar when He promised that He would hear and answer your prayers. You know enough scripture to know that is a lie! Were there fewer people praying to Him the hour you first gave Him your life and were saved? Of course not! He heard you then, He hears you now, but believing the lies of satan are getting in the way. This is not said to condemn you. We have all been there. I’m just trying to shed some light on the lies you are believing that are making everything so much harder on you. The answer lies in choosing to believe God’s truth on each one of these topics. “How can I be a positive influence for someone when I am so beaten down?” Dear sister, this is not your time to be the one doing that, but rather to allow others to do it for you. As Christians we know we are to serve others. It can be oh so hard to let others serve us! But this too is part of the journey. When we serve others, we receive a blessing. Would we deny our brethren the blessing from serving us? It is a test of humility cloaked in Christianity. See it for what it is – another step on the journey which can reap beautiful Fruit of the Spirit if we walk through it with our hands tightly in Jesus’, choosing consciously to believe only His Word and not the lies of the devil we hear in our own voice. We cannot bear one another’s burdens if you aren’t there. You said of this fellowship, “If you only get through to one person’s heart then you have done a great service for the One we serve.” You are right! We read that we are the Body of Christ which is made of different parts and though different, all are equally valuable and indispensable. The eye can’t hold food nor the ear walk. There are people that only YOU can reach just now! One who cannot be reached by someone who’s life is being good and easy right now would find your situation one they could identify with. As they see you openly and honestly walking through your dark time cleaving ever more to your beloved Savior, attending worship, going to the altar, they will see true Christianity in practice, not lofty words they can’t identify with coming from people with their fake Sunday Christian faces on. This is what being a Christian is all about – what we do in the storm. Now is the time to make the conscious choice to truly believe what He says in the Holy Scriptures and rebuke the lies of the enemy. Cry out to the One who loves you and died to save you and pour your heart out to Him. Nothing you say can surprise Him as He already sees your heart. Consider fasting and praying for Him to help you move into truly believing His Word in these areas. It will make an unbelievable difference in how you experience what you are having to walk through. He’s waiting for you, calling to you, drawing your heart to Himself to love and comfort you and assure you that He knows what’s happening. He hears your prayers and wants you to trust Him as He’s promised that ultimately, He will cause ALL things to work together for your good, as you love Him and are called according to His purpose. He does not lie. He is waiting to hold you. He loves you truly and will not stop. I’ve been where you are, often! Sometimes talking about things with another in Christ who has been there can help. That’s one reason NOT to withdraw during dark times – because we can each encourage the other. Just as Father, Son and Holy Spirit are one, He prayed that we also be one as they are. That can’t be when we withdraw. Forget putting on “Sunday best”, whether faces or clothes, and bring Christ your life! He will not disappoint you! Now for your gift! 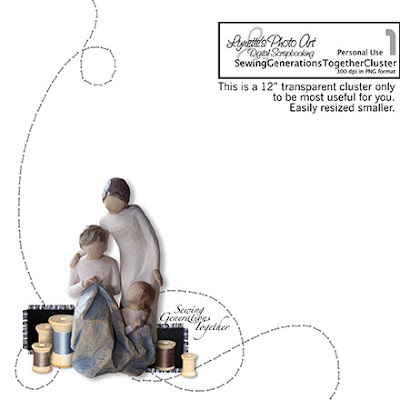 Given the topic I shared today, my Sewing Generations Together seemed the natural gift. My daughters gave me this Willow Tree for Christmas saying it reminded them of my quilting as they grew up, so the natural LO was some of my quilts. This has both of their very first quilts - their baby quilts and yes, we thought Melissa was "Matthew" LOL! 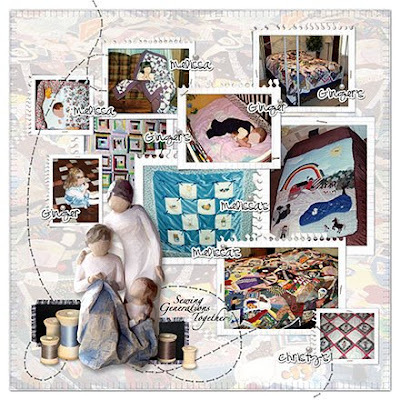 One of my dearest memories of childhood is a crazy quilt my father's mother had made. We only got to use it when we were sick. I absolutely loved the random shapes of rich colored velvet and her fancy stitching around them. It was truly comforting to stroke the soft patches when I was ill.
Obviously my most elaborate king sized quilts have been crazy quilts. I made them very 3D including all kinds of things from my daughter's lives, mementos, and things from both grandmother's. I even added coins from the years of their births under netting and they jingle. Both of their crazy quilts include a portion of their favorite jeans, including a pocket with their favorite tiny pound puppies stuffed into them, a baby dress they wore, a Barbie outfit we made together, their old Bible covers and even a patch of the only sofa (much loved) we owned while they grew up. When I was making my youngest's crazy quilt, she wanted a secret compartment so I sewed a patch with a zipper down the middle and a surprise inside. There are awards from school, pets they had, activities they loved, places they had visited and their father's employment. They each chose one of my Father's ties and I embroidered his birth and death dates on them along with a red rose as he gave my mother a rose from the yard every day in their latter years. Every seam on my youngest's is embellished with beading, lace, fancy ribbon work, ribbon embroidery or countless embroidery stitches, but I simply couldn't do the hand sewing any more when I made the last one for my oldest. I made a ShoFly quilt with every stitch by hand when they were growing up. It made me feel connected with women of yesteryear. It was the only quilt I've made using a pattern. Boy did that take a long time! But the winner was the youngest's crazy quilt. It took over 5 years! All my quilts, except the farm and the last two crazy quilts, where made entirely of old clothes and fabric that was given to me. The spools in this freebie are my grandmother's and I still use them. 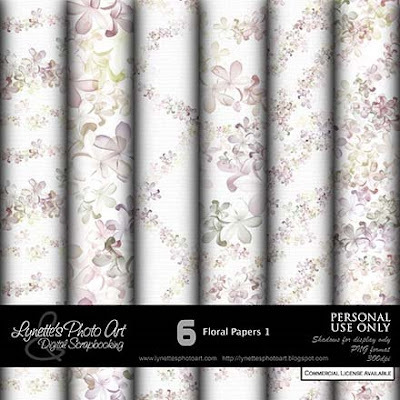 I have already given you the Frayed Fabric (you can still get it in the archives in the left column) and I'll be giving you the Willow Tree and spools also. Running stitch brush by ScrappinCop at http://thescrappincop.blogspot.com. Thanks ladies! 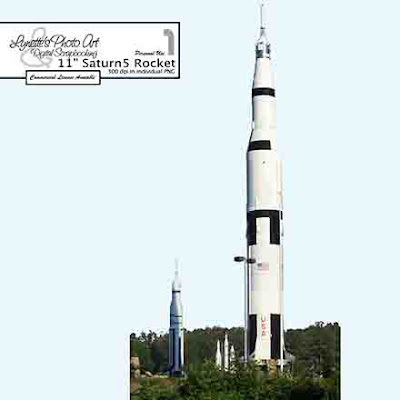 This is the Saturn 5 rocket at the Space & Rocket Center in Huntsville, AL. I'm very proud that my father-in-law helped design the Saturn 5, my mother-in-law was Dr. VonBraun's secretary, and my daughters' father has worked on the space shuttle for about 25 years. He made the composite nose cone for many years and is now in quality control and was present and honored at the last launch. His parents' names are in the Space & Rocket Museum in Huntsville, AL. I know the program is not what it used to be, but that's not the issue. It once was the glory of America and I am proud to have had a part of it through loved ones. Having said that, there are those who have become confused and look to the stars not for their beauty and praise the One who created them, but for guidance in their lives and even to worship them. They are created things just as we ourselves are created things. We would be foolish indeed to worship created things which are not worthy of worship. Only one is worthy of all worship and that is the Lord God Almighty Himself. Worshiping and revering anything except Him is idolatry and is summarily condemned in the Bible. I hope you can use this. 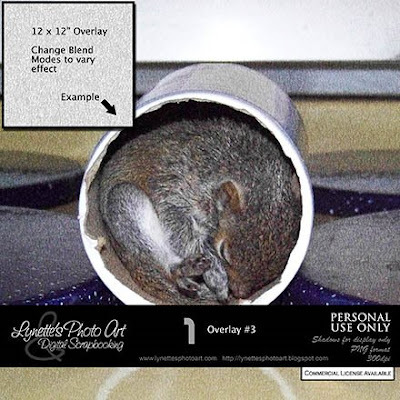 It's a full 11" tall and 300 dpi in png format. I cut it out very carefully, even around the leaves in the trees, so it's very good quality. 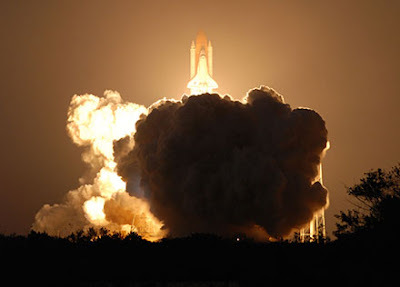 If you would like to see/download more space photos, there are literally gobs of them at www.nasa.gov. Before I share the love of God with you today, I HAVE TO share this amazing gift He's given Susan Boyle, just in case there is someone left who hasn't seen this. Wow! I adore Les Mis to begin with but ohhhhhhh, this is utterly wonderful! I hope the world is given more chances to hear what God has given her in the future. God bless you Susan and if you don't know Him as your Savior yet, oh with all my heart I pray you do! I would have put the video here, but they've disabled it so click here to be blessed! I'm very proud that my father-in-law helped design the Saturn 5, my mother-in-law was Dr. VonBraun's secretary, and my daughters' father has worked on the space shuttle for about 25 years. He made the composite nose cone for many years and is now in quality control and was present and honored at the last launch. His parents' names are in the Space & Rocket Museum in Huntsville, AL. I know the program is not what it used to be, but that's not the issue. It once was the glory of America and I am proud to have had a part of it through loved ones. 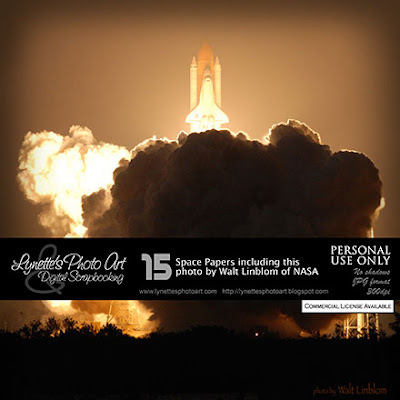 Today's gift is 15 background papers from outer space including this paper made from a photo taken by NASA's official photographer, Walt Linblom, of Discovery's STS-119 mission (the most recent launch), with his special permission. Isn't it just gorgeous? Thanks so much to Walt for his generosity! He said I could use the images on the www.nasa.gov site as long as I wasn't selling them, so the rest of the papers are from there. I thought they would work well with the Saturn 5 rocket element I'm giving you. This is a big download, so I won't be able to leave it up long - be sure to grab it while you can! (My 4shared space is running out so the biggest gifts can't be left there long.) If you would like to see/download more space photos, there are literally gobs of them at www.nasa.gov. 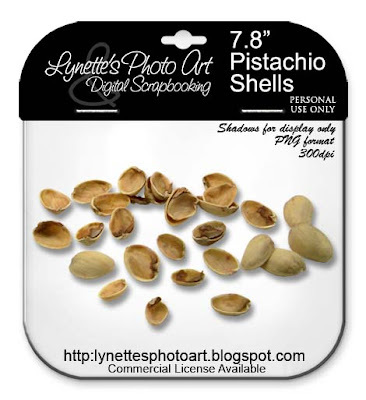 These pistachio shells are really cool looking and will be very useful in designing, but when you really think about it, the important part it was created for is missing. God created shells to protect seeds that would perpetuate species. Once the right season is here, the shells return to the soil, but the seed is changed into all kinds of magnificent trees, flowers and other things. The shell is necessary, but the seed is the most important part. They are missing here. When God created each of us, He left an empty space inside that we would always long to fill, and the only thing that would ever satisfy that hunger would be our Heavenly Father. It's how He draws us to Himself. It's that empty place that prompts us to seek Him, come to have an intimate relationship with Him, accept His only begotten Son, Jesus Christ, as our Savior and be saved eternally, ever to be with Him who loves us. We all seek to fill that space. We try human relationships, entertainment, money, power, fame, drugs, alcohol, pets, hobbies, travel, education, all kinds of things. But nothing ever truly fills that emptiness or satisfies us more than momentarily. Then we start longing again. We are empty shells longing to be filled. Are you an empty shell today? There is no better time than right now to close your eyes to this world and pray from the depths of your heart to your loving Father in Heaven. Tell Him you are deeply sorry for all the sin you have committed and ask Him to wash you clean from those sins in the blood Jesus shed to pay for your sins. Ask Jesus to be your Savior, committing to love and obey Him all the days of your life, because you are so happy He is forgiving you and you no longer face eternity in hellfire and damnation as we deserve, but now have a sure hope of heaven and joy forever. Then find a Christian who will immerse you in water baptism in the name of the Father, the Son and the Holy Spirit, as the Bible commands. Like any relationship, you will get out of it what you put into it. Say you have met a person. If you never spend time with them, never talk to them, don't learn about them, don't do things together, you will never be more than nodding acquaintances. But if you do all these things, you will become closer, learn to love them, enjoy them so much more. His answer to your intimacy with Him is always YES. What is yours? I didn't see anything there that requires us to have a "pretty voice", just that everyone is to praise our Creator with a joyful noise. Hmmm...don't think that fits those Sunday morning faces carved in stone as they trudge through hymn after hymn, their hearts never comprehending what they are singing. I think He is more pleased by the children in Bible class singing happily to Him and never hitting a note or keeping rhythm. You know Jesus tells us, "Truly I say to you, whoever does not receive the kingdom of God like a child will not enter it at all." Mark 10:15 He was not referencing their age, but many aspects of their nature, their attitudes. Here He meant their ability to sing joyfully with all their hearts. He also meant other aspects of children, such as their natural ability to "just believe". No over thinking. No doubting. This is how our faith in Him is to be; how our relationship is to be. This is how we are as children, before life teaches us that we cannot trust. He wants us to choose to go back to that attitude in our relationship with Him. Truly, that is the only place where such an attitude is not only warranted, but safe and appropriate. Some of you have been asking if all the flowers I've been giving you are from my yard - yes, all but a very few. When we bought our house there was nothing in the back yard except a cedar tree. 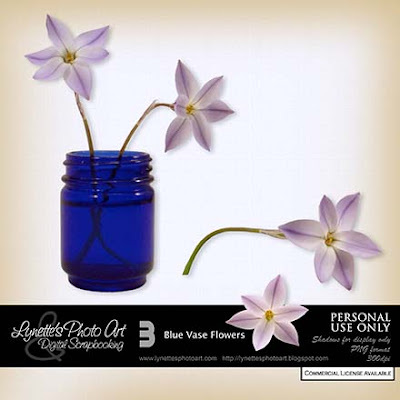 I wanted to put so many different blooming things there that when someone past a window or opened the door, they would simply have to praise God for His magnificent creation. I quit counting at 250 varieties. Over the years as things mature, we have gone from full sun to a lot of shade. Between the change in lighting and crowding, as it's a very small yard, many precious things are no longer here, but it's still lovely. Seven years of drought have hurt it and my not being able to physically maintain it like I used to have taken a toll, but as I said, it still takes my breath away and we do indeed praise God with every thought of it. I designed it so that almost everything is visible from the house and so that there are things blooming almost year round, but of course, spring is the richest. I wish just once everything would bloom at once! LOL...even the way it is, our cars parked on the other side of the house are literally yellow with pollen! There was a dip in the yard and my husband thought, why fill it in? Why not dig it deeper and put a pond in! So, we have made two ponds by ourselves and it's oh so nice! 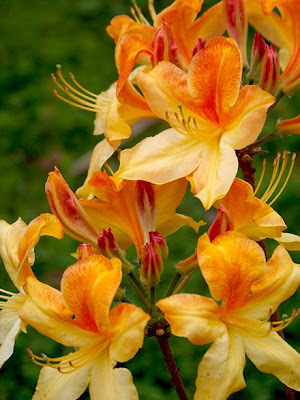 So for you nice people who asked about the flowers, here's a picture I just took of my Exbury Azaleas. (Please don't use this photo, I'm just showing you and it's low res for the web, not good for print). I think this one was called Tutti Fruity. Sadly our red one finally succumbed to the drought last summer. 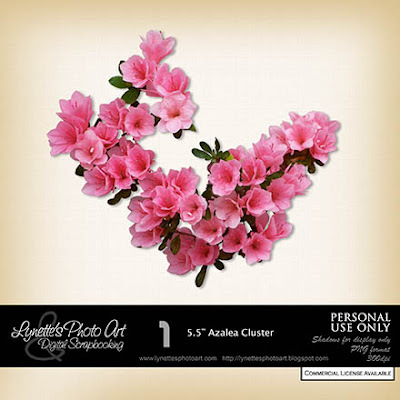 These are the coolest azaleas! I've seen a very old one that is like a small tree with a wild and irregular spread of branches, all tipped in these beauties! Yeah God! You are AWESOME!!!! 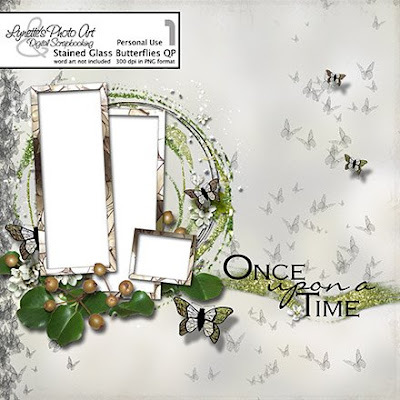 I made this lovely QP using the Bradford Pear Berries I have given you (still in the archives in the left column) and my Stained Glass Butterflies, which I gave you a couple of days ago. 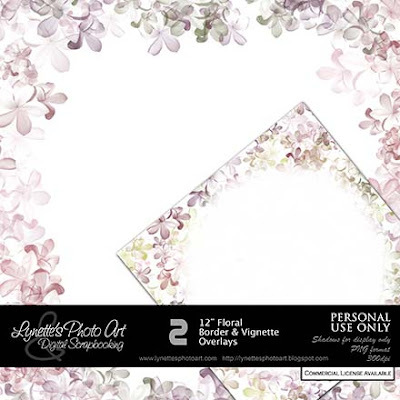 The quick page does not include the word art, to make it most flexible for you. The word art in the preview is by Caitlin Creations. The circle is by weedsandwildflowersdesign who refused to let it be part of the QP, but it's ok for personal use. So, the download doesn't include it, but that's where you can obtain the circle if you wish. I just love this page! These are not "suggestions" that we as Christians have the choice of doing or not. As those who have been washed in the blood of Christ for the forgiveness of our sins and adoption into the family of God, these are commands. And as always, they are for our good that we might all live happy and fulfilling lives in this world that glorify our Creator and God. 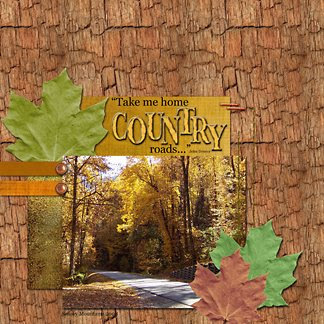 I am happy to share this layout that Louise has made using one of my Smoky Mountain Papers. Isn't her layout lovely?! I remember the humbling grandeur of standing there surrounded by that glory...mmm. Those papers are still available in the archives in the left column. Thanks so much for letting me share your LO Louise! I met a sister-in-Christ a while back who makes the most beautiful 2-page layouts and is so sweet and helpful. I was just at her site and she posted this poem by Luke Easter & Dee Cheeks. I liked it so well I'm sharing it with you. Do stop by and check out her blog. She's fantastic! SimplyYin and here is where Luke and Dee post their poems. Keeping her soul in shape, God leading the way. Knowing triumph through faith because the Lord is near. Being anointed with divine blood from the only begotten Son. And will not let business interfere with commitments as a wife and mother. And at the Creator’s appointed time she’ll receive all that is justly due. While thanking God for the blessings as she capitalizes on them. So when a situation arises again, she’s not afraid to answer the call. Understanding it’s more important to run a Holy Spirit filled race. And the love of God is forever with her, no matter how difficult or long. Why? Because a lesson not learned the first time is soon to be repeated. This is how these flowers grow. The words to this song are fabulous and so terribly important for everyone who has placed their hope for eternal life in Jesus Christ. If the musical style isn't to your taste, please read the words - don't miss this powerful and vital message for your life. Man I wanna tell ya'll something, Man. Man I'm not gonna let these material thing's get in my way, ya'll. I'm trying to get somewhere. That's real and pure and true and eternal. Though it's only in You that I can truly see that its a feast for the eyes - a low blow to purpose. And I'm a little kid at a three ring circus. Don't wanna walk away, let me hear the people say. The first thing to prosper should be inside of me. Since I got that call, no more Saul, now I'm Paul. How do I sense the tide that's rising? De-sensitizing me from living in light of eternity. As our eyes are open wide and on you. And may your kingdom be, what wakes us up, and lays us down. Haha, yeah, last door on the left, you'll hear it. I'm never gonna walk away. Yesterday I gave you this Azalea Cluster. If you missed it, go back and grab it! I made it into a much softer, lighter watercolor cluster here. 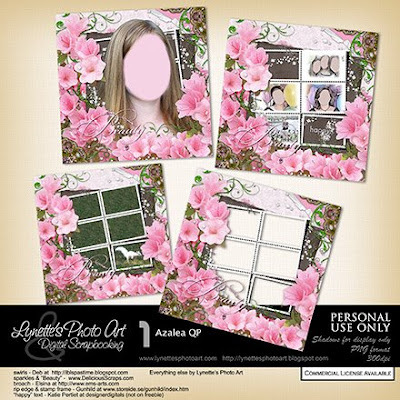 Then I did something new (for me) and fun...I used commercial use freebies from several other generous souls and this is what you get! Here are three variations I made up. One includes a gorgeous white squirrel my daughters photographed in North Carolina, for those of you missing our Winnie updates. I'm looking forward to using this for a wedding that's coming up. Some of my artwork will be my gift to her. 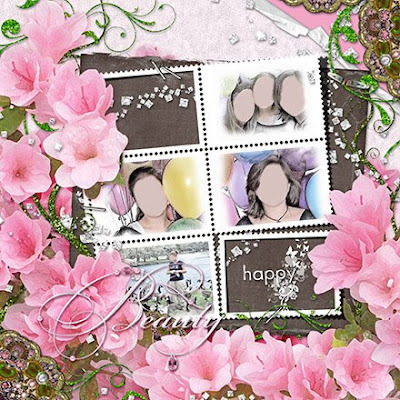 Credits: swirls - Deb at http://iblspastime.blogspot.com; sparkles & “Beauty” www.DeliciousScraps.com; broach - Elsina at http://www.ems-arts.com; rip edge & stamp frame Gunhild at www.storeide.se/gunhild/index.htm; “happy” text Katie Pertiet at designerdigitals (not on freebie as it's PU only). Thanks ladies! This is one of my all time FAVORITE worship songs. I pray you will watch it and fully open yourself to it's message. LOL even after all these years of singing this song, I'm mopping tears off my face just posting this for you! Tomorrow I'm giving you a QP made with the Azalea Cluster I'm giving you today. Here are some LOs I made with the QP. Be sure to come back and get it tomorrow. 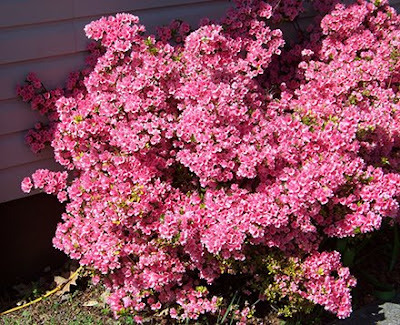 These are azalea bushes. They come in many colors and I've seen some as tall as a one story house at the Gulf of Mexico. My husband calls them "plastic flowers" because when ours are in full bloom they don't look real. 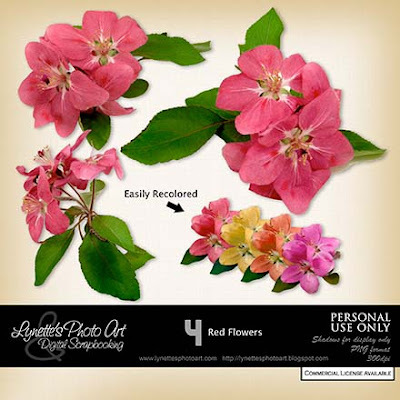 The bushes are covered solid in these flawless blossoms that look manufactured! :) Tomorrow I have a gorgeous QP for you using them. I have something wonderful for you every day, so don't miss one! If you download, please leave me a comment at the bottom of this post as I have disabled 4shared comments. This helps me to know what you like for the future. God bless you! It was during Passover so many years ago that the only begotten Son of God gave His life on the cross to pay for the sins of mankind, to redeem our souls from hell and make a way for us to be reconciled to God the Father so we can spend eternity with Him in heaven. Satan thought he had outsmarted God when Jesus allowed Himself to be nailed to that cross. He delighted in seeing Jesus hanging there, suffering, carrying all the sins of mankind, mocked and abused. But he was wrong. God knew man would sin in the Garden of Eden and fall from grace. He had a plan for the redemption of mankind before He created the earth. His plan included Jesus giving His perfect sinless life as the perfect sacrifice to atone for our sins - and then conquering death, hell and the grave for us! He rose from the dead and now sits at the right hand of God the Father. He is the perfect High Priest for those who have obeyed His plan of salvation and are living in obedience to His Word - the Bible. He is always interceding on our behalf to the Father. He is not on that cross any more! He is alive! He is the victor! The work of the cross is done - forever! As Christians, we are all on a journey. We are in the process of growing closer to God and being brought into conformity with Jesus Christ in all our ways. Each of us is at a different point along this journey and it would be wrong to judge another by where we are and where we think he is. This is completely between each of us and God Almighty. Let's give grace to each other and be always willing to listen, search our Bibles and pray about new things we hear to see if they are true and be willing to change immediately if they are. There is grace for those who do not know better, but once we see something in our lives is wrong, we need to repent and conform to God's will in all ways. We long only to be pleasing to Him in all things - always. Here is a thought to consider. When well meaning people wear crucifixes, crosses that have Jesus still hanging on them, it makes satan very happy. 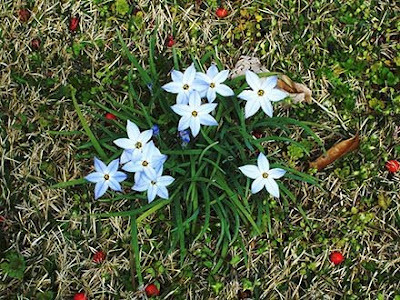 He has lost the war, but when he sees these, it gives him pleasure remembering the day he thought he was killing God's Son in humiliation and shame. When people wear these or have them in their homes, they mean to be honoring His sacrifice. They need to realize they are also placing the emphasis on satan's moment of supposed triumph against our God. They are leaving out Jesus' victory! He is not on the cross any more. Satan can't keep Him there, how sad that we do. The entire point of the cross is the empty tomb. We wouldn't wear a symbol of a tomb with Jesus in it and not one showing that the tomb is empty? Perhaps it is better to wear a cross that is empty also. It would still honor His sacrifice without so delighting His (and our) enemy and would show that He is no longer on that cross, but is victorious and will soon come again to judge this world. God knew mankind would tend to "worship" the "things of God" instead of God Himself. So He made sure not to record things we'd wrongly worship, such as: the date of Jesus' birth; the location of the cup from the last supper; the ark of the covenant; the exact locations of things like His tomb (we are making educated guesses where things were), etc. He does not want us to worship a cross, or any emblem. The cross itself is in no way holy. The Son of God who gave His life on it was and is Holy. He wants us to worship Jesus who gave His life in our stead on a cross. If we can wear or display crosses without worshipping them, then it is ok. But if you ask the Holy Spirit to show you the truth of your heart and find you are worshipping the cross itself, it's time to repent and give the worship only to the God who deserves and requires it. Worshipping anything other than God Almighty, (the Trinity), is idolatry and is a sin He condemns with terrible consequences. I'm giving you these Stained Glass Butterflies for Easter because the butterfly is the symbol of new life and Easter is when we celebrate Jesus Christ's victory over death on our behalf and His sacrifice that gives us new life in Him for eternity if we obey what He has commanded. They recolor well and are soooo pretty! I will be giving you this lovely QP using them sometime soon.